When 65% of supply chain executives say they are experiencing challenges in hiring and retaining a skilled workforce and 45% plan to increase new hires, it means manufacturers and distributors will need to re-think their labor strategies and implement new processes and technologies. TZA’s third annual Workforce Planning Survey asked executives and senior managers about their labor management programs, top-of-mind workforce challenges and future hiring plans. Their responses point to a continuing evolution in workforce issues where controlling costs remains important, but managing labor performance, reducing turnover and using temporary staff effectively are all part of a complex labor landscape. According to respondents, combating turnover continues to be a top concern with little positive change from previous surveys. For 2017, executives are also concerned with low workforce productivity and their lack of visibility to performance. Faced with this conflicting mix of challenges, 78% of respondents are using engineered labor standards and/or labor management systems to provide the technology to boost workforce productivity, control labor costs and gain better visibility to their operations. Nearly a third of respondents are also planning to evaluate and expand the role of LMS technology and practices in their operations. Are you facing these same challenges? How are you responding? 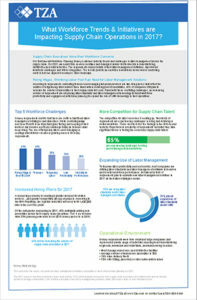 For more details on what supply chain executives told us, please read our Workforce Trends & Initiatives Impacting Supply Chain Operations infographic.